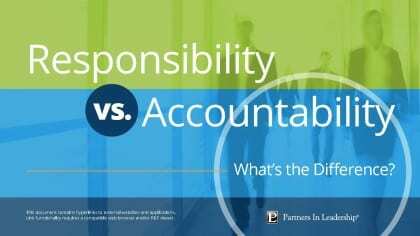 While the words responsibility and accountability are often used interchangeably, we believe there is an important and fundamental difference between the two—a night and day difference—and that currently adopted definitions for accountability are wrong. 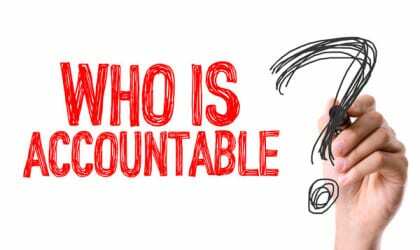 We appreciate the definitions and respect the notion of being responsible and the need for it, but we know from decades of experience that accountability is something truly empowering, not something consequential (“subject to; answerable”). When people use these two words synonymously, this misapplication can unintentionally create tendencies to blame, add unnecessary confusion, cause disengagement, and lead to poor performance. Is More “Responsibility” Going to Lead to Success? Define roles and job descriptions with focus. Have processes and systems in place. Have feedback sessions in the form of reviews. Even consistently hit their numbers. Siloed thinking and acting with reluctant behaviors around getting involved in things outside their control. “I thought you had it” mentalities where people ignore and deny one another’s ability to positively contribute. Attitudes where people justify the ways they think and act to cover their tails. Poor performance and development due to infrequent feedback exchanges. These last points around justification and feedback are possibly the most damaging. Justifying the way you think and act in an effort to “cover your tail” pulls in the opposite direction of achieving results—often sapping time and resources to the detriment of others or the organization. And when it comes to feedback, many organizations rely solely on performance reviews to exchange feedback and it’s typically too late if and when the person receives the feedback. With other companies, feedback only occurs when things go wrong, and, in the worst cases, not at all. In fact, our Workplace Accountability Study revealed that 80% of survey respondents said that feedback is typically consequential or not even being exchanged. This huge miss prevents employees from truly developing and inhibits their ability to get the right result. 80% of those surveyed say feedback is something that happens to them only when things go wrong or not at all. Read our eBook, Responsibility vs. Accountability, to learn more about the subtle, but crucial, differences between responsibility and accountability. Organizations often try to solve these problems by redefining responsibilities—reorganizing what people do and restructuring the way work is done—only to find that changing where people sit in the organization won’t necessarily change how they think and perform. 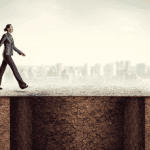 What they are lacking is personal accountability—involving a choice to move closer to the success that you or your organization wants. When you step up to greater personal accountability, employees stop blaming each other, salespeople stop blaming the marketplace, companies stop blaming their competitors, and we all stop blaming the economy—you get the picture. Finding convenient reasons to shift responsibility or blame is never effective and never brings better results. People at all levels take ownership for the strategic results of the organization. Balls do not get dropped and projects do not slip through the cracks. People think differently about the job that needs to get done. 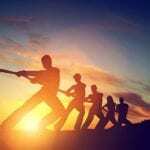 People break-down barriers and collaborate to achieve the right results. Why? Because accountability is a broader concept than responsibility—it’s something you do to yourself, not something that someone does to you. It’s with this version of accountability that people not only take accountability for the results they need to achieve individually but for results that they are not 100% in control of. 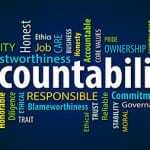 Organizations embracing positive accountability have a culture of people that hold themselves accountable for the ultimate results of the organization. These traits have proven, over time, as being the mandatory actions that create the process of taking positive accountability. Adopt the right mindset and step up to these traits and you’ll quickly realize that accountability is not assigned, not put upon, not, at times, so exactly defined that it creates silos, finger pointing, and the blame game. It is chosen. Working on getting good at the 16 Accountability Traits is just that—work. Where do you begin? Look them over and be honest with yourself on the ones you need to improve. Think about what you can do better and where you can help others. In time, taking accountability for demonstrating improvement in these 16 areas is going to enhance your life, both personally and professionally. When individuals, teams, and organizations choose greater accountability, you’ll see and get more. More ownership. More performance. More innovation. More heart. And better results. In summary, responsibility can be given or received, even assumed, but that doesn’t automatically guarantee that personal accountability will be taken. Accountability is a choice. If that choice isn’t made, it’s possible to have responsibility for something or someone but still lack accountability. So, responsibly choose accountability. As you do, you’re sure to discover just what accountability can do for you and those around you. 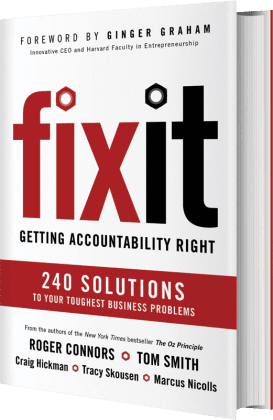 Download a sneak preview of our newest book, Fix It: Getting Accountability Right. In the book the authors explore these 16 traits in detail with 240 proven practices from 120 executives.